From the time I graduated college (in 1989), I’ve consistently heard claims that the traditional sales force is going the way of the dinosaur. While the calls for the end of professional selling have certainly been premature, I was reminded of this issue when I came across an article, How The Internet Is Making Us Poor. The article sites a study by the St. Louis Fed, pointing out that because of the Internet, “People who process information are losing their jobs at rates comparable to the rate of loss in manufacturing,” with sales jobs being among the chief victims. Certainly, companies like Dell and even Apple have demonstrated that you don’t need highly paid, highly incentivized sales reps to move expensive complex products. I know many a CEO that would be happy to hear the news that the sales force is a dying concept. As a member of and frequent speaker to CEO groups like Vistage and EO, I’ve seen first hand how challenging it is to hire effective sales people across the board. There certainly would be some happy executives if we could simply design a marketing strategy, apply some voodoo SEO, and then sit back and wait for the cash register to ring. Then I remembered my favorite quote about statistics… They’re like a lamppost for a drunk – used more for support than for illumination. 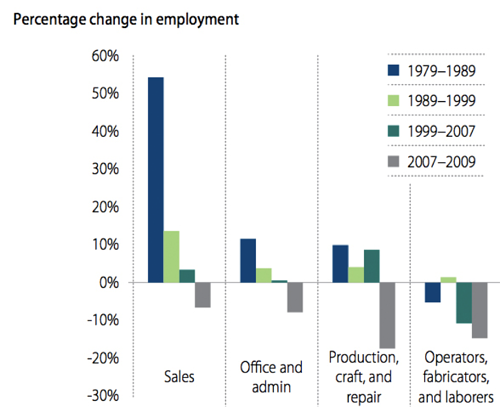 The Fed study concluded that those who process information are losing jobs. Therein lies the rub. In the 70s, 80s and even into the 90s a salespersons fundamental job was to process information. They were the kings of intermediaries. They could succeed without actually creating any value, as they were already a necessity as a means to communicate it. Even as we entered the 21st century, salespeople could hit quota and survive if they just worked hard enough. As I’ve shared often, those days are long gone. But, as the saying goes, we shouldn’t throw the baby out with the bath water. While killing the sales force is a bad idea, it is mission critical that B2B SMEs rethink their approach to building, managing and maintaining a highly profitable sales force. The first thing you should do to grow sales is hire more salespeople. Sales generalists are the best way for SME’s (or any size company) to build a sales team. There’s no “right way” to sell, everyone does it differently. In The New Design of Business, author Roger Martin talks about three phases of design. He says that everything starts out as a mystery. The mystery phase is highly complex and confusing, as there are no clear rules about cause and effect. As the mysteries are studied, themes (or heuristics) can emerge. These themes help tell the story of cause and effect. The challenge is that while these rules are often correct, and bring some degree of order to bear, they are not always true, leaving some complexity that must be managed. As the design deepens, algorithms, or pure patterns, can emerge. These patterns are like mathematical formulas (hence the term algorithm) about cause and effect, and are always true. By the way, when algorithms dominate a job function, employment opportunities will drop. A profession that deals in mystery is akin to art, and a profession anchored in algorithms is akin to science. Sales is in the middle – neither art nor science. Success requires a system designed to take advantage of the themes that work, and have the flexibility to the uniqueness of each interaction. B2B Sales is far too complex today. Far too much of “the sale” takes place when the salesperson isn’t even present. Buyers are too harried and fragmented for one salesperson to be able to manage the process effectively. The sales process depends on multiple talents that don’t exist within one person. Success in B2B sales today requires focus and specialization. This is important so that you can match the talent of the individual to the task at hand, and to gain both the efficiency and effectiveness that focus brings. Inherently a marketing function, lead management is responsible for the generation, cultivation and conversion of an increasing number of qualified leads that are positioned to be sales ready. Forward thinking SMEs will integrate proven inbound and content marketing strategies, with an effective outbound effort led by an inside sales team. As the lead management team moves the lead to a “sales ready” status, it is turned over to a new sales team, responsible for managing the sales process. This new team will serve as the lead to determine the actions that will be taken, by whom and when. This position, which I typically call the engagement role, is the one that is most similar to the traditional sales role. Several advantages are gained by focusing exclusively on the new sale process, such as greater capacity and improved performance. Once a sale has been made, it should be managed by a client services or account management team who is responsible for managing and expanding the relationship. Turning over a client/customer/account to an account management team does introduce a degree of complexity, but that is overwhelmed by the increased efficiency, capacity and economic benefits associated with this model. There is only one reason that this model should not be adopted by an organization in today’s B2B world. The single-word reason is laziness. It’s easier to just have one person handle the whole process. There’s less risk of communication mistakes, management of the function feels easier and you don’t need to develop and manage the systems needed for such an approach. In the very short-run, this approach could (and I emphasize could) increase sales costs marginally. In the medium and long-term, this model reduces sales costs and frees up capacity to allow for consistent growth. The truth is that such poor sales design is doomed to mediocrity at best. Today’s technology tools allow businesses of any size to optimize the management of the sales process, and the increasing complexity and competition of the market demands it. The upside is that once the investment of time and effort is made building the system, the revenue growth process becomes far less disruptive and the opportunity to scale presents itself. It’s your choice. Continue to play a traditional game that clearly isn’t working, throw the whole thing away for an e-commerce model, or jump ahead of your competition and build that system that makes sales growth predictable.